Have you ever left your children with a babysitter and couldn’t escape the feeling that maybe you forgot something? 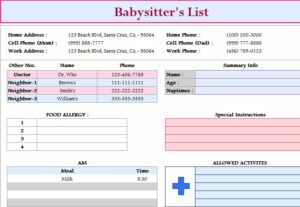 The free Babysitter’s List Template is your new way to ensure that essential information is given to your babysitter so you can spend your night out without worry or concern. The template allows you to craft a customized sheet that is specifically tailored to your child and their needs. You can plan everything from their daily routine to important items that need to be finished by the time you get home. If you want to use this free template today, just follow the instructions given below. To download this free template, all you need to do is click the link at the bottom of this page. The next step will be to enter your contact information in the space at the top of the page. This will include the home address, phone number, and other contact information that might help your babysitter under certain circumstances. The next section is for special emergencies. Here, you can list items like your doctor’s phone number. If your child has a certain food allergy, no problem, just enter that into the “Food Allergy” table in the rows given. If you have special instructions, pertaining to that food allergy, then enter them in the “Special Instructions” table. There are two different tables for meals, one for the AM and one for the PM. Enter the meals you have scheduled for the child in these tables. One of the best features of this template is the “Allowed” and “Not Allowed” sections. Here, you can enter activities that your babysitter can do to entertain your child. Conversely, you can also enter items that you don’t want your child to engage in. If you have any extra notes, place them in the blank tables at the very bottom of the template. You can see how easy it will be to ensure your babysitter has everything they need to care for your child.